My name is john and I live on the mid north coast of NSW Australia. Only last weekend we picked up a small dumper to take to Rallies along with some vintage engines and tractors that we have. We believe that this may be a Benford make but we are seeking some information that we can then place on the display board that tells make and model and a short story about it. 2 cylinder Lister diesel #2917SR2A25. 13.2 HP @ 1800 RPM. Newage Coventry 3 forward & 1 reverse speed gearbox. #A14271. Made by *M Type 2. Plate on the chassis near the rear of the dump body reads G5-U04-9713. So any information will be very much appreciated in identifying make and model and any details on the dumper at all. I will try and attach some pics for you to maybe help identify or just to enjoy. This little dumper starts very easily by the crank handle and the inside of the engine is squeaky clean so it has either been rebuilt recently or had a very easy life. I believe that if it was required a "cold start" position is on the engine where a linkage is attached but this started right up with 4 swings on the crank and release the decompression lever and all in 6'c temperature. I think it is a Liner Roughrider 1250...!? In some ways the pic on the bottom right looks similar to mine. Does anyone have a list of serial numbers etc to try and confirm make and model? I know that this MIGHT help in the identity of the dumper and it is unbelievable that I haven't noticed this earlier but today as I am working on redesigning the hand brake set up I noticed on the steering wheel hub the letters MCC. Does this help at all in find a maker? A big thank you to everyone who has contributed to helping me find out the make and model of our new toy. 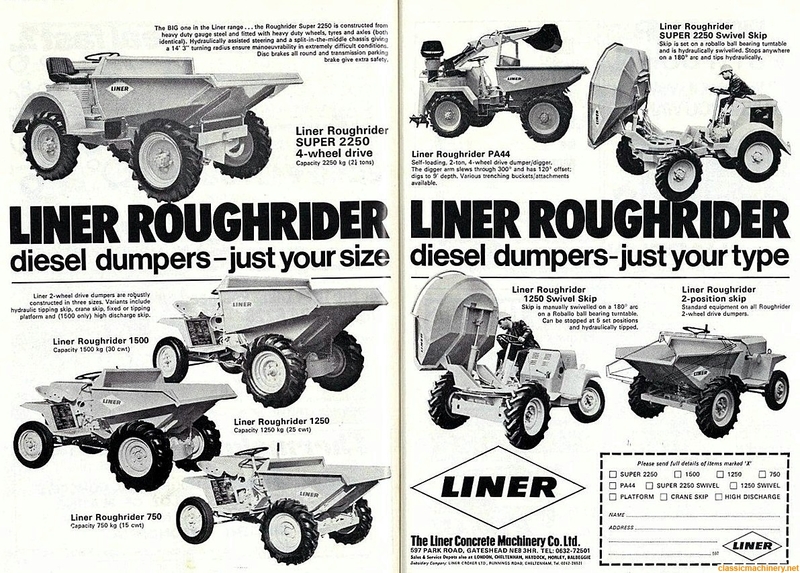 Now that we have a good idea of it's origin is there a Company that sells reproduction ID plates for this Liner Roughrider 1250? Or can anyone with a good picture of the ID plate please post the image so that I can reproduce one please? Obviously using my own serial numbers. Is there also an image as to how the handbrake mechanism is connected? Yes, the hand brake! You should have seen what was there before I started to correct it. At the moment the handle is sitting in the applied position with nothing connected to it. I have made up a small pulley and brackets to convert it all to being a cable hand brake system and this should be completed and working early next week as I need to have the 'thimbles' crimped onto the cable properly. So I wont be the owner of any 'acreage' as I am a firm believer in safety first with all our toys and is why it is still sitting on the back of Lorry our truck. Yes, thank you very much for the link. As I may have said early in the thread that when we picked this up the temp was not quite at 0'c but it was not far off it and this little engine without using the cold start system burst into life after about 3 swings on the handle and throw the decompression levers over and away it ran. The more I look at this little beauty the more we like it and we certainly liked it enough to buy it in the first place. It will compliment our tractors, stationary engines and mowers, all vintage. The bin on ours measures 1450 wide x 1040 front to back. Would this make it a 1250cwt or a bigger 1375cwt? Other things I have remedied is a fuel leak simply by tightening the air bleed nut on the engine side of the sediment bowl and made a bracket to safely hold the crank handle under the bonnet. Is there somewhere I can buy an ID plate to replace my missing plate that mounts on the rear of the dumper to the left of the crank shaft? So many questions all the time! Thank you to everyone who has offered advise and help to me, I really appreciate it.